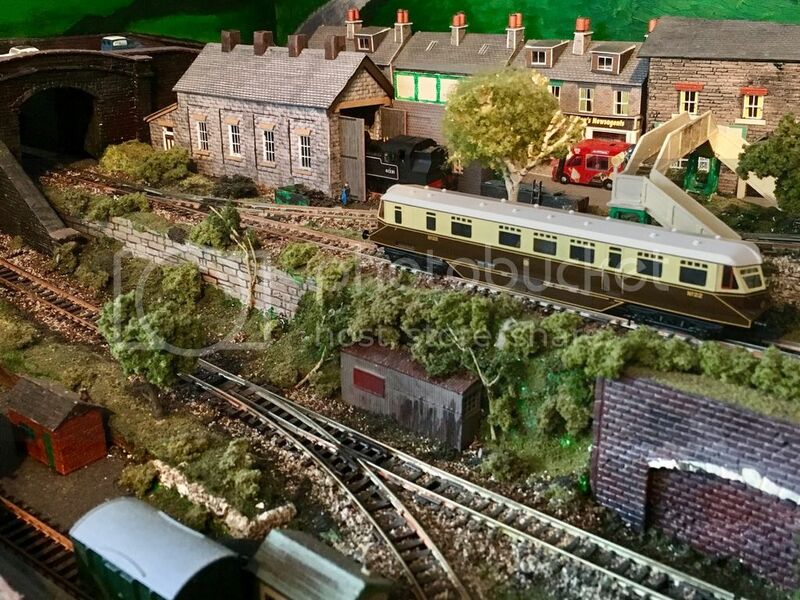 Hi There Martin, nice to see you have combined your two layouts together, great pics of life at PortPerran/Trepol bay. Rumours are rife amongst linesiders in North and West Cornwall that the local 14XX tank which has been a resident of Truro shed for many years working local passenger turns at off peak times (when a single autocoach suffices) is heading off to Swindon works for a heavy general overhaul and thence on to pastures new. 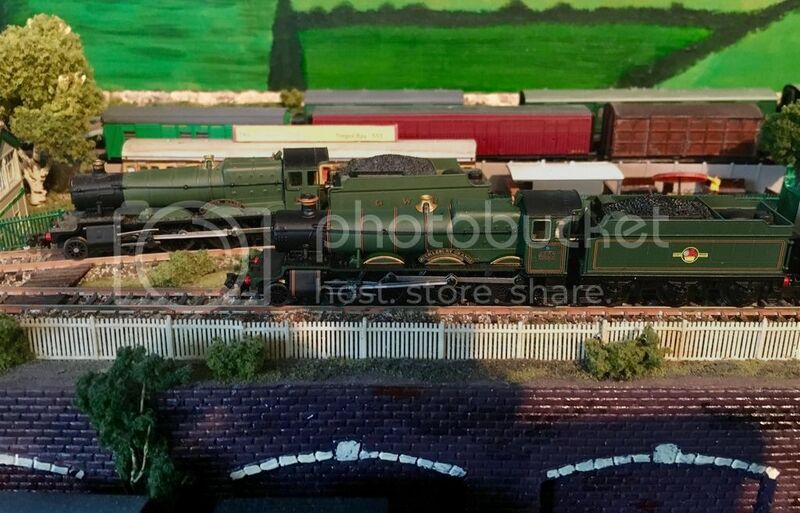 it is strongly rumoured that the black liveried 14XX will be replaced by a similar machine fresh from overhaul and a full repaint into green livery. 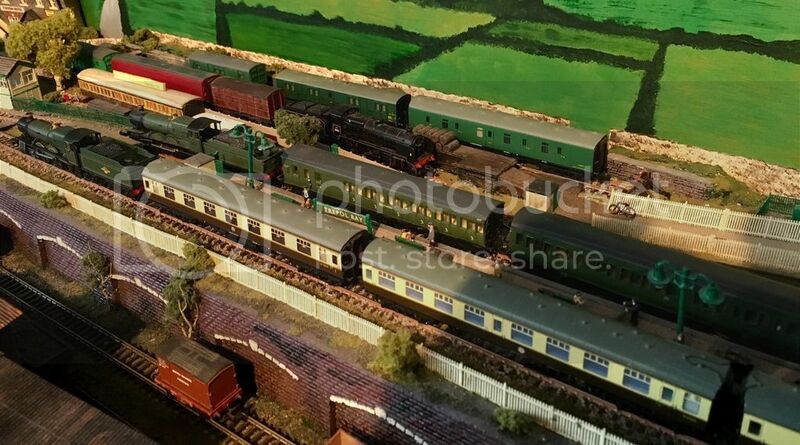 It is further rumoured that, during the Summer timetable, a BR Lined Green 14xx plus a BR Livery GWR design autocoach will be running between Penmayne and Port Perran on special enthusiast charters. The 14xx will be substituted by a similarly liveried 64xx (to cope with the gradients) if bookings require more than one autocoach. An onboard service of locally sourced light refreshments will be served by the "Chelsea Girls". Special preview runs have been arranged for publicity purposes by Sylvia and Eli in co-operation with BR WR and the CLPG. Port Perran and Trepol Bay are bidding farewell to a couple of old friends. Thank you very much, Martin, for another pair of excellent photos. 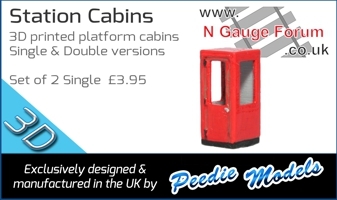 The GWS (Bodmin) is very grateful to its friends at Port Perran for looking after it's preserved GWR diesel railcar and is looking forward to welcoming it back, later this summer, after a full mechanical overhaul [DCC-fitting by Douglas of Wickness Models]. The GWS, not to mention Sylvia, is also looking forward, this summer, to welcoming preserved 1419 from a similar full mechanical overhaul, this summer. As a result of engineering work near Newquay earlier today, there have been some unusual locomotives rostered to trains. 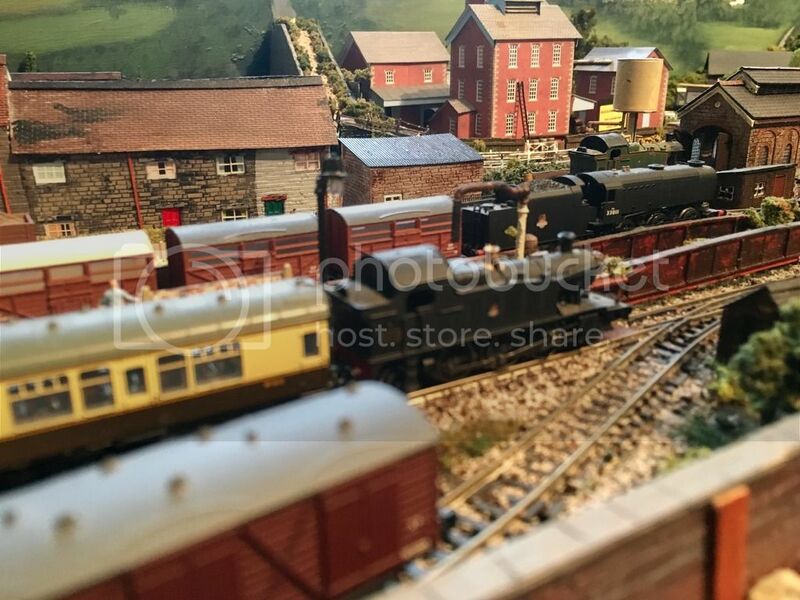 Thanks for a couple of really evocative pictures, Martin. They are very clear and portray the scene admirably. I really must buy my new camera soon! Thank you, Martin, for another pair of excellent photos. of interesting trains. Similar broccoli specials have been run from Penmayne and Cant Cove (for the "Castle Estates"). Another unusual locomotive working this evening sees Standard 4 80130 at the head of the 18.10 Wadebridge to Truro milk train working to Truro via Trepol Bay, Port Perran and Chacewater. This train is normally in the hands of a D63xx diesel or an ex GW prarie. It is thought that the Standard is deputising for a failed hydraulic. The stag beneath the bridge looks wary but the pigs (one of which is a prize Gloucester Old Spot) seem unconcerned! 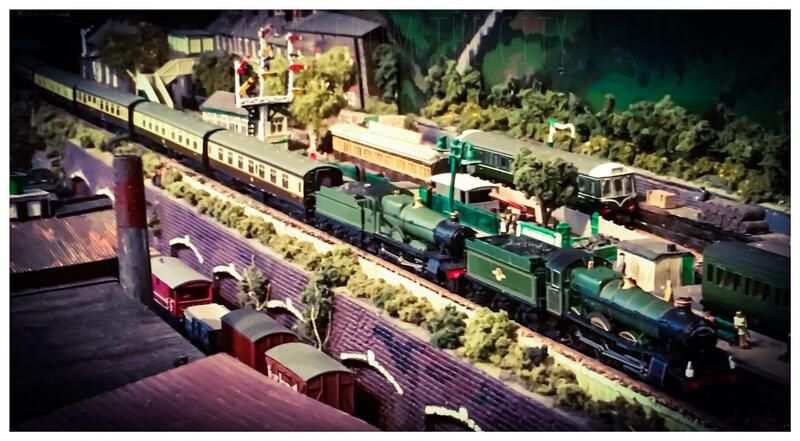 Thanks for another very nice photo., Martin, of an interesting train. 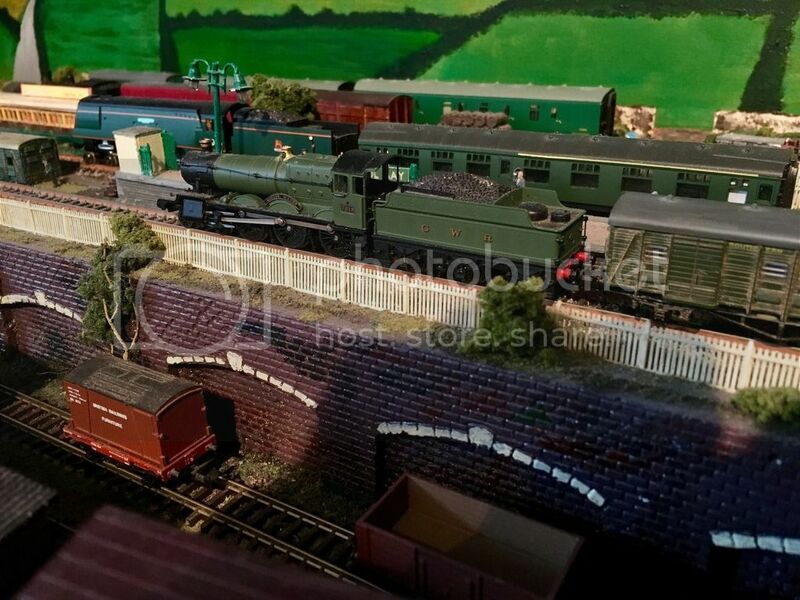 The BR Standard 4MTs are rumoured to be planned to replace the 'N' Class 2-6-0s, in the future. The local SR crew think highly of them. 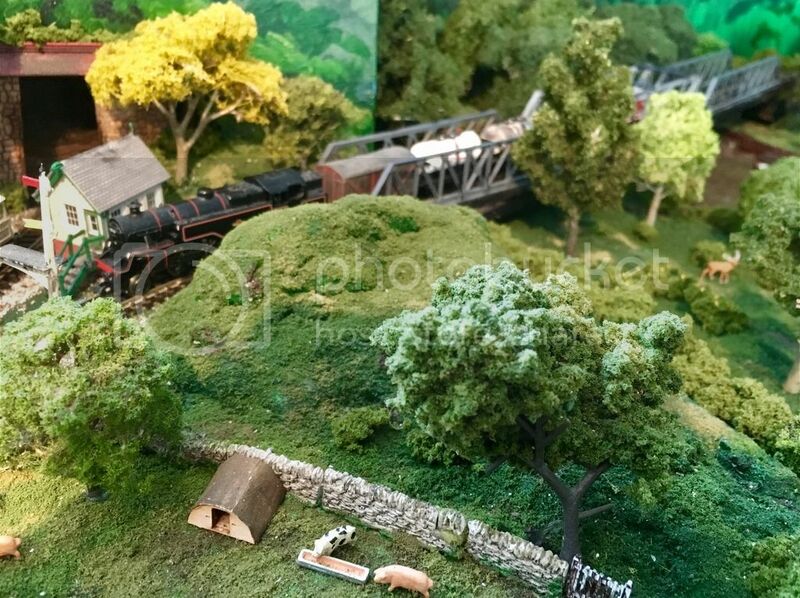 It was good to see the pigs enjoying the sunny weather (I knew they were on the layout) but had not seen them, before. Don't forget the stag lurking beneath the bridge Chris! Ah, yes, the stag looks very good, too, Martin. Some of the stag's relatives can be found in the extensive grounds of Trevelver Castle. I wonder what the mystery loco. could be? In 1961, BR SR and WR combined to upgrade the line from Bodmin Road-Wadebridge-Penmayne but the work was stopped at Cant Cove after the Chairman of the new British Railways Board, Richard Beeching, ordered a halt to such investment pending a full review of the rail network. Consequently, locos. are still, usually, changed at Wadebridge as the bridge over the inlet to Cant Cove does not allow anything heavier than a Bulleid Light Pacific, 43XX or a "Hymek" to be used on to Penmayne. The new locomotive allocated to duties on the Truro to Wadebridge line has made its debut today amidst some secrecy. 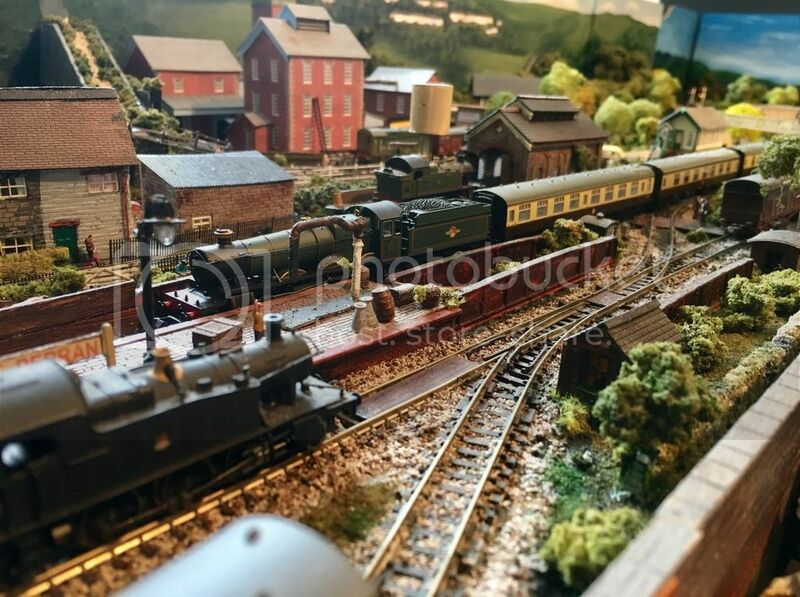 Luckily, a local enthusiast was at the lineside and managed a few photos. He is currently in the darkroom so hopefully the identity of the loco will be revealed very soon. 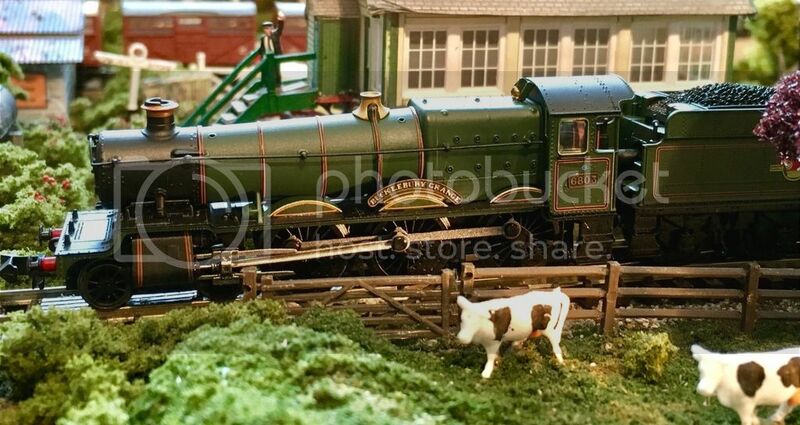 And here are the first photographs of ........6803 Bucklebury Grange, very recently drafted into West Cornwall and allocated to Truro depot. First a close up on the approach to Port Perran with a train from Wadebridge to Truro. Entering a busy Port Perran with the same train. The earlier. Outbound(Truro to Wadebridge) train at Trepol Bay. Finally, an unusual sight. Two ex GW 4-6-0s at the ex SR station at Trepol Bay. The other loco is 7819 Hinton Manor. Thanks for the excellent photos. of the new arrival, Martin. A very appropriate type of loco. for Cornwall. 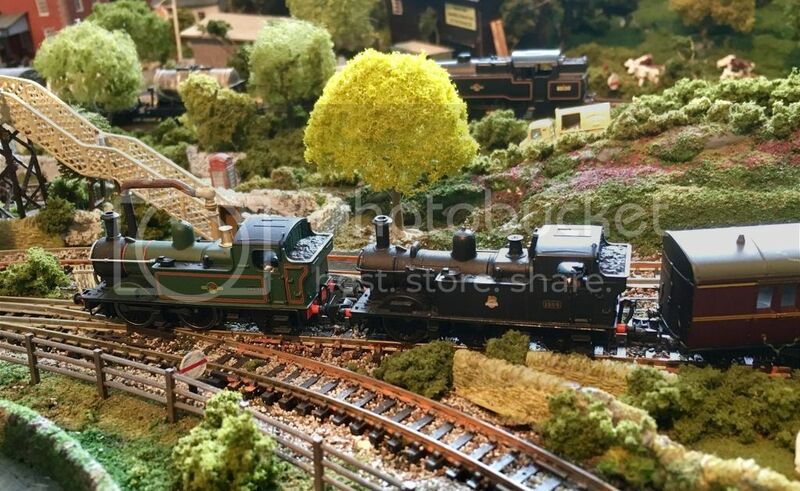 I'm still planning to buy a Dapol "Grange" myself, in the future. Truro had a number of "Granges" allocated in the 1950s and early 1960s. The last being 6854, in 1961. St. Blazey also had a number of "Granges" allocated in the late 1950s and early 1960s. The last three (1961) being: 6825, 6875, and 6812.